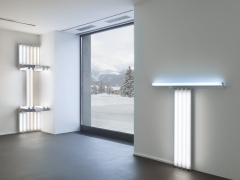 St. Moritz, Switzerland Beginning December 19, Vito Schnabel Gallery will present Dan Flavin, to Lucie Rie and Hans Coper, master potters, the first exhibition to bring together the work of artist Dan Flavin, renowned for his work with fluorescent light, and acclaimed European ceramicists Lucie Rie (1902–1995) and Hans Coper (1920–1981). 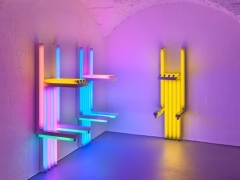 Eighteen significant light works from Flavin’s two 1990 series dedicated to the Vienna-born Rie and her German-born protégé Coper, respectively, will be shown in juxtaposition with a group of fifteen vessels from his personal collection of objects by the London-based potters. 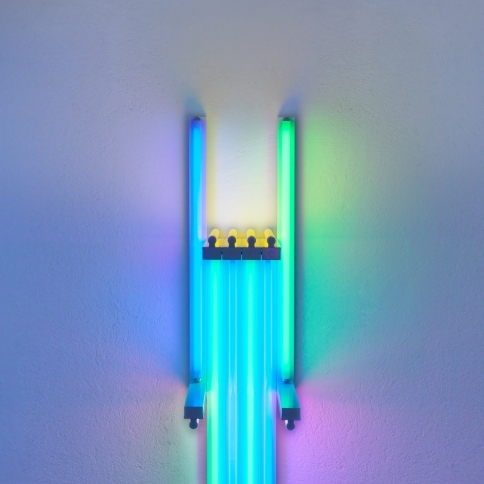 Organized in collaboration with Stephen Flavin, President of the Dan Flavin Estate, the exhibition has been conceived to explore affinities between three artists who employed dramatically different mediums to establish and redefine space, and to investigate issues of materiality, harmony, and permanence. 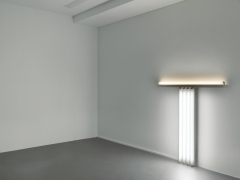 On view through February 4, 2018, Dan Flavin, to Lucie Rie and Hans Coper, master potters marks the beginning of an ongoing collaboration planned by Vito Schnabel Gallery and the Dan Flavin Estate. The exhibition will be accompanied by an illustrated catalogue featuring essays by curator and art historian Marianne Stockebrand, and Jenni Sorkin, art historian, critic, and Associate Professor of Contemporary Art History at the University of California, Santa Barbara. 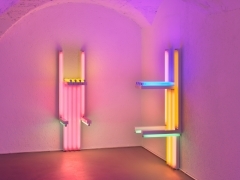 Radical visionaries of their respective mediums and disciplines, Flavin, Rie, and Coper are principal figures of the twentieth-century postwar avant-garde. 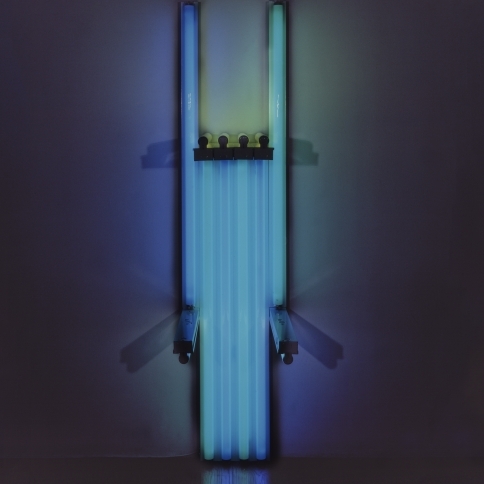 Flavin, a titan of “situational” installation art, and Rie and Coper, masters of modern craft, were equally uncompromising and sensitive producers of form. None of the three would claim to be adherents to sculptural tradition; but their practices, while unique, shared a clear intention to address overarching aesthetic concerns of their time. 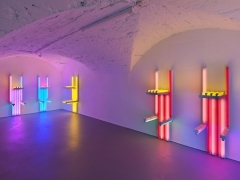 For example, Flavin’s light “proposals” — here, arrangements of different colored fluorescent lights comprising the series untitled (to Lucie Rie, master potter) (1990) — and Rie’s ceramic pots, which express endless variations of certain basic shapes, are united by their makers’ exquisite rigor and a dedicated reductivism that adheres to a sensual, meditative visual paradigm embedded within the discourse of form. 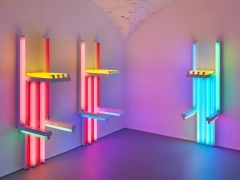 When Flavin first discovered and began acquiring the work of Rie and Coper at the New York City gallery of fellow artist Hiroshi Sugimoto in the 1980s, he undoubtedly recognized the achievements of kindred spirits. 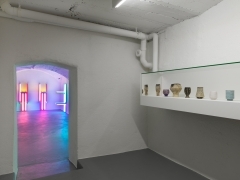 As with his dedication to commercial fluorescent lighting, the potters constructed entire radical oeuvres upon the single deceptively ordinary medium of clay. 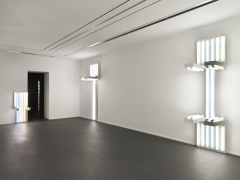 And like Flavin, Rie and Coper employed repetition and variation to elevate the humble to the level of the sublime. 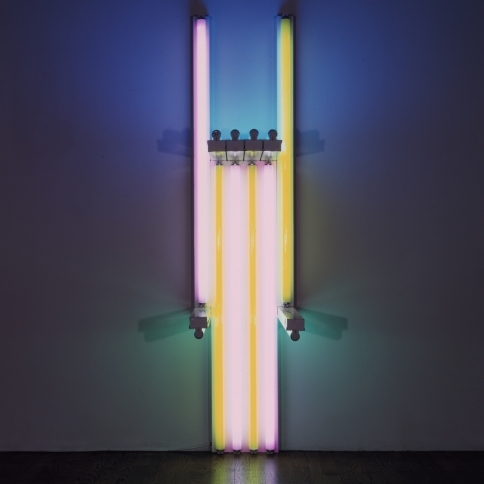 Fluorescent light was commercially available and its defined systems of standard sized tubes and colors defied the very tenets of Abstract Expressionism and Pop Art, from which the artist sought to break free. 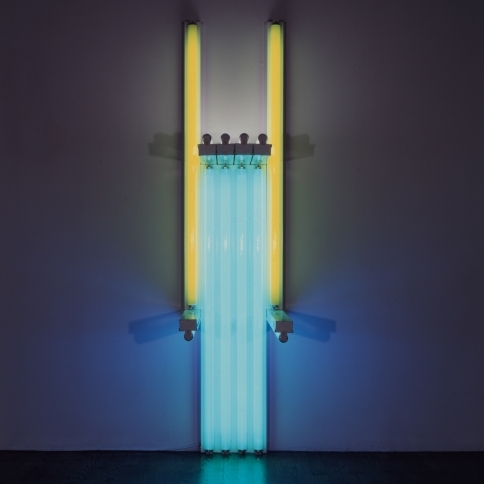 In opposition to the gestural and hand-crafted, these impersonal prefabricated industrial objects offered, what Donald Judd described as “…a means new to art.” Seizing the anonymity of the fluorescent tube, Flavin employed it as a simple and direct means to implement a whole new artistic language of his own. 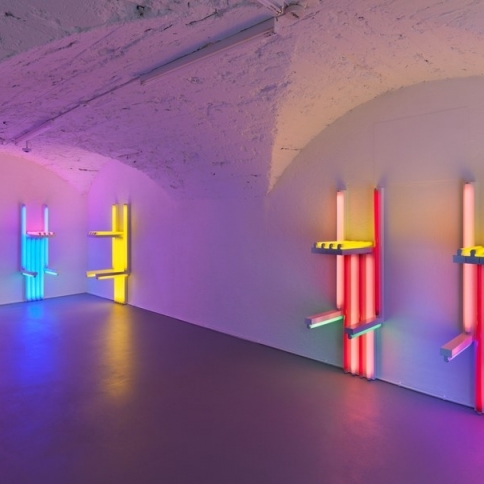 He worked within this self-imposed reductivist framework for the rest of his career, endlessly experimenting with serial and systematic compositions to wed formal relationships of luminous light, color, and sculptural space. In his late, dedicated series untitled (to Lucie Rie, master potter) and untitled (to Hans Coper, master potter), both of 1990, Flavin’s parenthetical titles affectionately express admiration for the two British potters, while deftly asserting his own work in a dialogue with these canonical figures of the history of art. 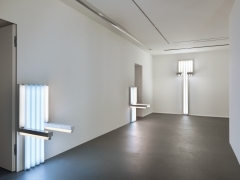 With many works in his oeuvre, Flavin’s dedications avow a humanizing sentiment — toward family, friends, colleagues, collectors, and others ranging from contemporaries like Judd and Sol LeWitt, to modernists Henri Matisse, Vladimir Tatlin, Constantin Brancusi, and here, to Lucie Rie and Hans Coper. 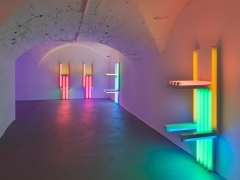 By paying homage to an extraordinary artistic partnership that would alter the discourse of the Arts and Crafts movement in Britain, Flavin acknowledges the forging of Rie and Coper’s collaborations in London in 1946, a venture of artistry and grace that would persist for thirty-five years. Devoted to the ebb and flow of the potter’s wheel, Rie and Coper’s practices were bound by a rhythmic and metered approach to making. As Coper once explained, “The wheel imposes its economy, dictates limits, provides momentum and continuity. Concentrating on continuous variations of simple themes I become part of the process… resonant to my experience of existence now.” Tireless in their distinctive explorations of ‘the vessel’ and inquiry into the traditions of pottery itself, Rie and Coper’s oeuvres manifest forms that are always insistent upon function and purpose, while bringing studio pottery into the realm of sculpture, architecture, and twentieth-century design. The startling sophistication of Rie’s delicate, thin-walled vessels accrues with subtle variations in proportion and size. Pared down to their material essence and free of adorning brushwork or even the potter’s hand thrown lines, her forms inch ever closer to a state of ultimate refinement through repetition. Her prodigious inventiveness is nowhere more evident than in her handling of color and texture. 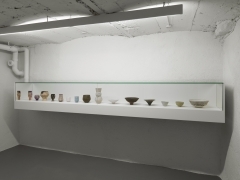 Rie’s preferred practice of raw glazing required the artist to apply slips and glazes one at a time, allowing pots to dry fully between the application of each layer until the clay was ready to be once-fired in an oxidizing kiln. Rie’s late Footed Bowl, c. 1986, displays the rich but subtle surfaces that resulted from her highly disciplined elaborations of just a few fundamental recipes that she tested to endless effect. 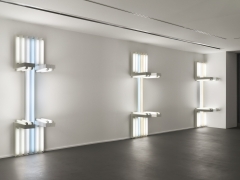 Similarly, the very notion of variation and repetition is reflected in Flavin’s series dedicated to Rie: a single composition of six vertical and six horizontal fluorescent tubes mounted to a wall. 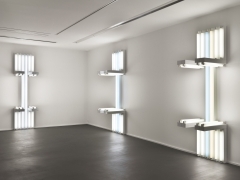 Resonant of Flavin’s dictum, “It is what it is, and it ain’t nothing else,” each work in this series reveals itself identical in construction, repeated time and again. 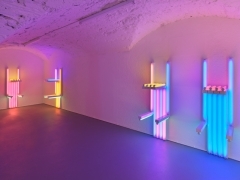 Yet it is in Flavin’s modification of emitted light, much like in the glazes of Rie’s pots, that harmonious and symphonic washes of color converge and blend to differentiate one form from another. 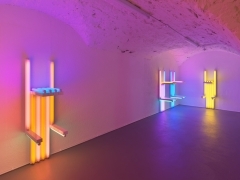 Like Flavin, Coper made work rooted in a discourse that reached far beyond his medium. In his forms, a passion for Cycladic art and ancient carvings converges perceptibly with his admiration for the work of modernists Brancusi and Alberto Giacometti. And formal elements of monumental twentieth-century sculpture appear in Coper’s pieces to be deciphered on a domestic scale. Works such as Spade Form, c. 1965, dispense with pottery’s traditional categories like bowl, pot, jug and jar. In place of these, Coper coined terms for the forms of his vessels: spade, bud, cup, egg, flower, and arrow. 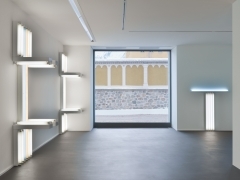 Often thrown as two or three composite parts that were then unified and joined together, Coper’s objects with the illusion of volume, profile, and three-dimensional space. Sharing an inherently banality, a lone ceramic pot may seem as solitary and unremarkable as a tube of fluorescent light. 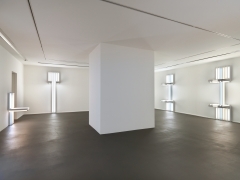 But manifested by the hands of Coper, Rie, and Flavin, form transcends the innate character of function and design. 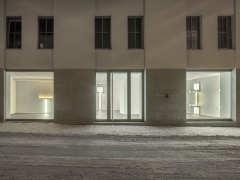 The work of all three artists achieves a sublime directness in approach to materiality that, in turn illuminates and sculpts the spaces inhabited by their objects. With Rie and Coper, hand-thrown and crafted vessels revive a timeless medium whose undeniable permanence seems to contradict Flavin’s perishable, ephemeral medium of light. Yet transcending the boundaries of sculpture and pottery alike, degrees of originality and daring unite all three artists’ oeuvres. 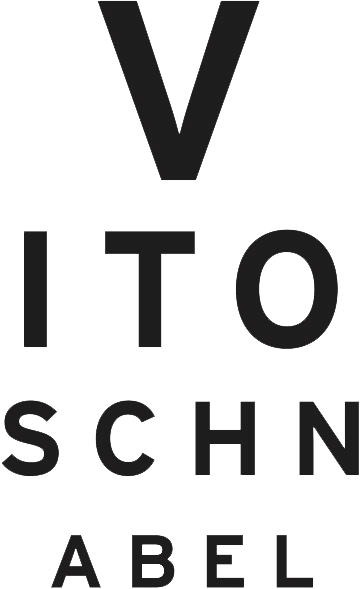 There will be a reception on Friday, December 29, at Via Maistra 37 from 6–8pm.